Tom Sykes (above) posted his fifth Superpole win of the season in succession after a two-part ‘Wet’ Portimao Superpole and in doing so took a new track best lap of 1’41.360. The Kawasaki Racing Team rider took pole by just a thousandth of a second over Eugene Laverty (Aprilia Racing Team). The same gap between the top-two riders in Superpole happened only once before, when Ben Spies snatched pole from Michel Fabrizio at Kyalami in 2009. The 1’41.360 set by the British rider means also a new Best Lap for the Portuguese track. 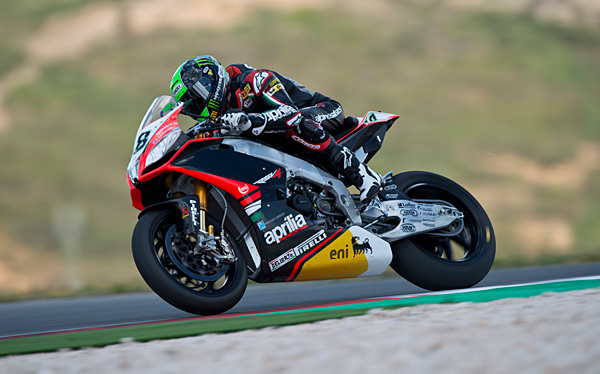 Aprilia’s Eugene Laverty….a hair’s breadth from taking pole! Jonathan Rea (Pata Honda World Superbike) completes the first row of the grid for tomorrow’s two races, matching his previous good performances from qualifying. Fourth place Marco Melandri (BMW Motorrad Goldbet), who went out firstly on race tyres, then switched to his second qualifying tyre, finished ahead of Sylvain Guintoli (Aprilia Racing Team). Loris Baz (Kawasaki Racing Team) was finding the going tough but after good work from rider and team he moved from tenth in combined qualifying to sixth in Superpole. 40-year-old Carlos Checa will be hoping his shoulder injury holds up this weekend. An improving Carlos Checa (Team Ducati Alstare) was able to put up a good lap on board his 1199 Panigale R despite his left shoulder injury and will start from seventh on the grid. Having missed Monza and Donington Park, Checa admits his shoulder isn’t recovering as quickly as he had hoped. Frenchman Jules Cluzel (FIXI Cluzel) was eighth at the flag followed by the Italian trio of Michel Fabrizio (Red Devils Roma Aprilia), Ayrton Badovini (Team Ducati Alstare) and Davide Giugliano (Althea Racing Ducati). 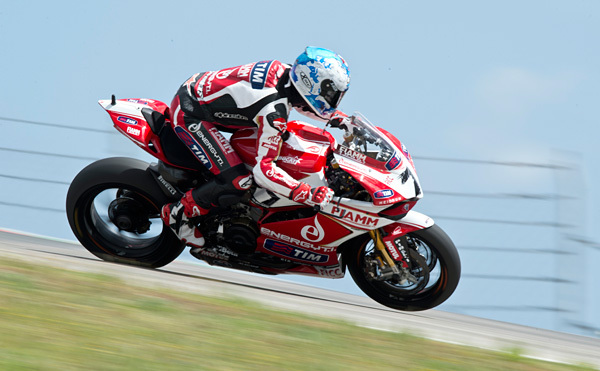 The 2011 STK1000 Champion had an innocent crash at Turn 8 during the last Superpole session. Sheridan Morais (PTR Honda) looking for a big finish tomorrow. Yakhnich Motorsport Yamaha’s Sam Lowes continues his 2013 pole position streak by securing the top spot on the grid – for the fourth time in a row – after today’s Qualifying 2 at Portimao. The current Championship leader set a successful lap-time of 1’44.804 using race tyres, resulting the only rider able to lap below the 1’45 bracket. Kenan Sofuoglu (Mahi Racing Team India Kawasaki) will start tomorrow’s race from 2nd place, followed by Sheridan Morais (PTR Honda), team mate Fabien Foret and Andrea Antonelli (Team Goeleven Kawasaki).